Yellow-gold with attractive colorful highlights, Gala apple's pinkish-to-reddish-orange stripes are the usual identifying characteristics of this aromatic fruit that offers a juicy crunch and a sweet tangy flavor. Some Gala strains may be nearly solid red. This apple is considered to be one of the sweetest of all. A superb dessert apple and excellent for fresh eating and baking, make pies, tarts, cobblers, sauces, cakes, quick breads, kuchen, cookies and muffins. Apple flavor and texture add dining pleasure in a variety of savory dishes. This attractive apple dresses up a fruit bowl centerpiece. Chilled slices make a perfect edible garnish. Sliced or cut apples stay white longer if put in a bowl of water containing two tablespoons of lemon juice. 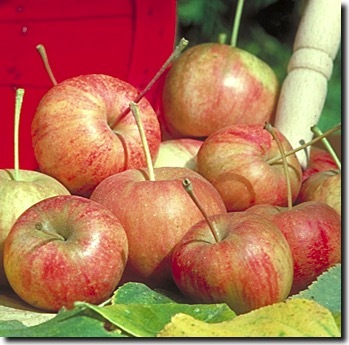 To store, keep apples as cold as possible in the refrigerator. This apple stores well. Cortland is a typical McIntosh style apple variety, and ranks about 12th in terms of US apple production. However nearly all that production takes place in New York State, almost within sight of Cornell University where it was developed at the start of the 20th century. Cortland is also widely grown across the border in Quebec and Ontario, and it has proven itself to be well-suited to the freezing temperatures experienced around the Great Lakes. 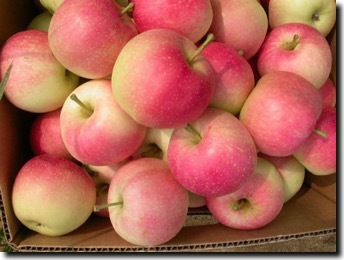 As with all McIntosh varieties, Cortland is at its best when eaten soon after being picked. An interesting characteristic of Cortland is that the flesh does not go brown very rapidly after being cut.